Display board used by Ray Wells to give the audience a tactile experience of the tectonic motion of the Pacific coast of North America. On the largest scale, the Pacific NW is the scene of a collision between the North American tectonic plate and the Pacific plate, with the Pacific plate motion NNW in relation to North America. Sandwiched between the two are a couple of small oceanic plates, the Juan de Fuca and the Gorda Plates, which are the remnants of an ancient great oceanic plate dubbed the Farallon Plate. The boundaries of these plates have been determined by mapping of the ocean floor and mapping the earthquakes whose hypocenters are located within the oceanic plates. The interface between the Gorda and Juan de Fuca Plates and North America is a great thrust fault, the Cascadia Subduction Zone, which periodically ruptures and causes great earthquakes in the Pacific NW. In addition there are periodic deep earthquakes in the subducting oceanic plate that are in response to this activity. The topic of Wells’ lecture, however, focused upon crustal earthquakes that occur near the surface in the North American Plate, and are a response of the plate margin to the forces which are acting upon it in this tectonic environment. 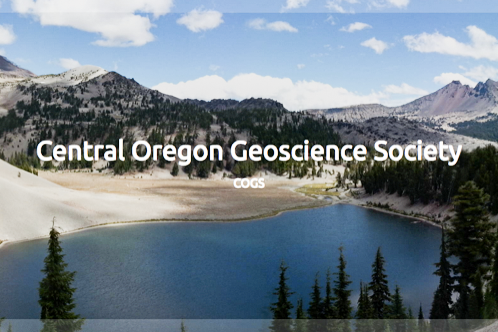 A lot can be learned from studying maps of crustal earthquakes and volcanoes of the Pacific NW. One sees a lot of crustal earthquakes in the Puget Sound area, activity all the way south to Portland, then there is little activity through Oregon and the Klamath Mountains but lots of activity south of that. Also, there is a lot of volcanic activity in Oregon in the straight line formed by the Cascade Mountains, but north of Oregon the Cascades volcanoes are more isolated (‘big ice cream cones’). What this suggested to research geologists was that western Oregon and the Klamath Mountains of northern California are in effect a ‘mini-plate’ that moves pretty much as a solid block. Wells called this the Oregon Coast Block. It is bounded by the ocean on the west and the Cascade Mountains on the east. Crustal earthquakes vs. volcanism in the Pacific NW. From USGS web page “Tectonic plate motions, crustal blocks, and shallow earthquakes in Cascadia,” see link below article. Much data gathered over the last several decades supports the idea that the Oregon Coast Block (OC) is moving as a block and is rotating clockwise at a fairly steady rate, and has done so during the Tertiary and Quaternary geologic eras -- 70° rotation for the last 60 million years and 18° for the last 15 million years. These measurements are obtained from paleomagnetic studies, which takes measurements of the magnetic orientation which is set in volcanic rock when it cools from magma, in alignment with the magnetic polarity of the earth. More recently, measurements from GPS stations have corroborated the paleomagnetic data. The movement measurements of the coastal areas from northern California to lower British Columbia show that there are regions of distinct characteristics which fit rather neatly into a block model of motion. The blocks from south to north are the Sierra Nevada block, the Oregon Coast block, the Washington Coast block, and the Canadian Coast Mountains Buttress. The motion of the Pacific Plate is dragging the Sierra Nevada block NNW, and in turn this block is pushing the Oregon Block northward. But the Washington Coast block has nowhere to go, as it is constrained by the Canadian Coastal Mountains Buttress, so it is getting squeezed from Oregon to the South and Canada to the north, and this resistance is also rotating the Oregon block clockwise. And these motions are expressed in the Washington Coast Block as E-W trending thrust faults, which are absorbing the shortening of this part of the coast. A major example is the Seattle Fault, which is responsible for a much greater earthquake risk than that of western Oregon. And that brings us to a more general discussion of earthquake hazards in the Pacific NW as a result of all this crustal motion. In addition to the threat of a great earthquake the whole length or a major part of the subduction zone and the intra plate earthquakes with a deep focus (1949 Olympia and 2001 Nisqually earthquakes are examples), there are also hazards from shallow crustal faults in the North American plate. The greatest risk areas are western Washington, especially the Seattle area, all the way south to the Portland basin, where several crustal faults converge. There are also numerous faults in the Yakima Fold and Thrust belt to the east. Crustal faults do exist in western Oregon, but there are fewer of them. “Tectonic Earthquakes of the Pacific Northwest,” a video available on YouTube and produced by a joint venture of IRIS (Incorporated Research Institutions for Seismology), USGS, and funded by a grant from the National Science Foundation, 2015. Dr. Wells was the science advisor for this project and it contains an animated version of the concepts discussed in the lecture. R.E. Wells, R.J. Blakely, R.W. Simpson, C.S. Weaver, R. Haugerud, and K. Wheeler “Tectonic plate motions, crustal blocks, and shallow earthquakes in Cascadia,” in current research topics from the Pacific Northwest Geologic Mapping and Urban Hazards section of the USGS web site, 2016.